The electric guitar has surpassed the piano as the most popular instrument of budding musicians. While the reasons for this trend are numerous, it’s quite obvious that most households no longer have a piano, while many a dad or mom has an old guitar tucked away in a closet for junior to explore once the music bug starts to bite. Of course, the goal for every young player is to buy a guitar of his own, and to that end, Ibanez has been most helpful. The company’s 30-year-old Artist Series has been continually updated to provide modern variations on the two-humbucker mahogany guitar theme, with prices that are commonly far below market value. New to the series is the ART300, an unusual and interesting single-cutaway that has active pickups and a raised reptilian finish. This kind of bold and inventive thinking is exactly what I love about Ibanez, the same company that cuts monkey grips into $2,500 works of six-string art. While a guitar’s look is usually not the deciding factor that gets you to buy it, it is certainly reason enough to pick it up. The 300’s most eye catching feature is a scalloped maple top that’s textured like a topographical relief map. Ibanez Guitars call this its Black Caiman finish (the guitar shown is the crocodile-approximating Brown Caiman). If you’ve ever marveled at the illusion of depth that’s created by a 5A big-leaf maple quilted top, then you must already recognize this pattern of tactile troughs and trenches. Ibanez’s Caiman finish makes a guitar feel the way a quilted maple top looks. 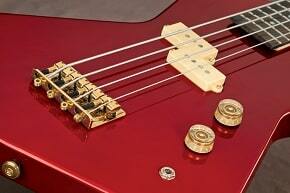 Like all other Ibanez Artist Series guitars, the mahogany body is set up for two humbuckers. Ibanez’s own IBZ LO-Z low-impedance active pickups fill these slots and pull power from two AA batteries (an access door makes battery changes fast and simple). Their output is hot enough to push any amp hard but very clean and expectedly low in distortion— which is pretty damn impressive considering that they require only one- third the power of a typical nine-volt system. Two volume knobs, a master tone and a three-way toggle control the electronics. Strings pull through Ibanez’s own Gibraltar III bridge assembly, a lightweight and low- friction component set that enhances both volume and sustain. The 24.7-inch-scale mahogany neck on the ART guitars is quite the opposite of the ultrathin Wizard- style necks for which the company is best known. It’s a set mahogany neck topped with a wide strip of rose- wood and sporting a beefy profile. A thin accent strip that outlines the fretboard and maple top adds a lot of class to the overall presentation, as does the nicely crafted diamond and crest pearl inlay. The average player who chooses a guitar from Ibanez’s Artists Series wants the warmth of a mahogany guitar and the more pronounced treble response afforded by Ibanez’s special hardware and super-tight construction. These attributes on the ART300 are turbocharged by the active pickups’ headroom and powerful output, especially in the high-mids and treble. It’s not the most organic tone, but it’s an exciting match with a high-gain amplifier, like my FJA modded Mesa Road King II. I was really impressed by how the neck pickup’s sharp focus cut through even the ridiculously overdriven red channel of this hot-rodded amp. For my heaviest rhythm tones, I ran the Mesa full tilt with the bridge pickup at max and then dialed in just a little extra meat with the neck pickup’s volume control. Metaphorically speaking, the ART300’s clean tone performance is much like a northeastern fall forecast: good air quality and striking colors abound, but expect it to get dark and cool early. Rockers who use more than two effects will find this neutrality easy to blend and especially clear through a long signal chain. IBANEZ’S ART300 and its scalloped maple top look more like an entry at NAMM’s custom guitar competition. Amazingly, this mahogany rock guitar frequently streets for under $400—about the same price as a boutique effect pedal. When you consider the build quality and the inclusion of Ibanez’s Gibraltar III bridge and a screaming IBZ Lo-Z active pickup system, the Artist Series ART300 is clearly a guitar worth checking out, whether you’re trying to ditch your dad’s old warhorse or looking for a tonally versatile addition for your collection. Thanks to Guitar World for the awesome review.